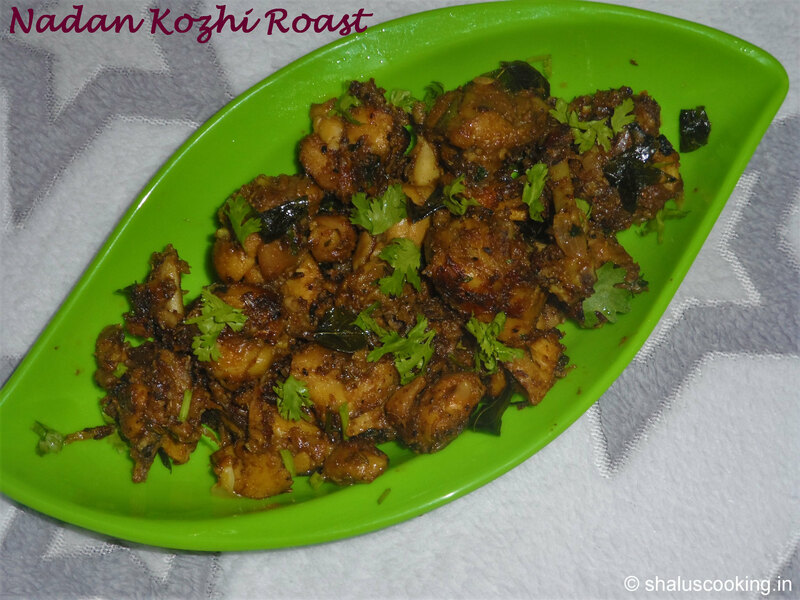 Nadan Kozhi Roast - Country Chicken Roast, this recipe is prepared in Kerala style. Actually, my in-laws are from Kerala. So, I get to know few recipes from Kerala Cusine through my mother-in-law and her sisters. This is one such dish. 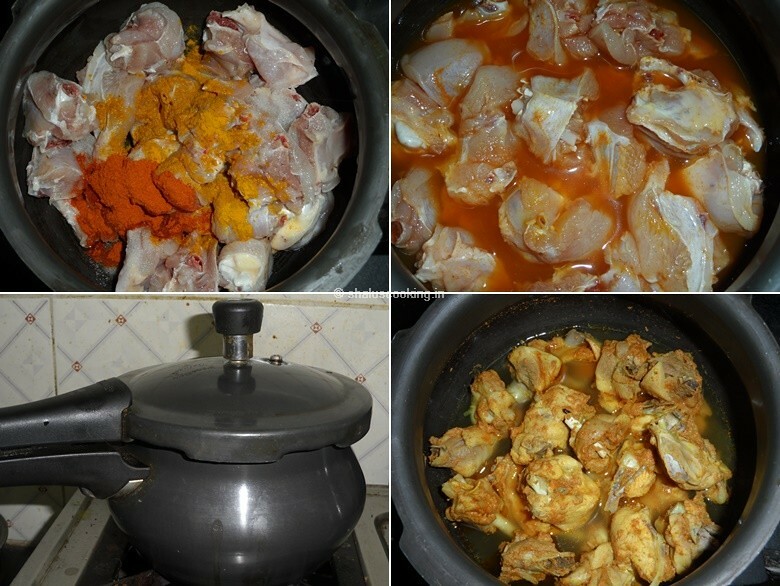 Preparation wise, this recipe is very easy to make except the part in cooking the chicken. Nadan chicken generally takes more time to cook. So, in this recipe I just altered that part by pressure cooking the chicken to reduce the cooking time. But this doesn't change the taste. It was as good as cooking on pan. Chilli Powder - 1 tsp. Turmeric Powder - 1/4 tsp. Black Pepper Corns - 1 tsp. 1. Keep all the ingredients ready to make Nadan Kozhi Roast - Country Chicken Roast. a. Clean and wash the chicken. b. Slice the onions in lengthwise. 2. Take the cleaned chicken in a pressure cooker. Add turmeric powder, chilli powder and salt. Add enough water and pressure cook the chicken for 6 to 7 whistles. 3. Heat oil in a pan, add fennel seeds and curry leaves. When it sizzles, add the onion slices. 4. Saute the onion till golden brown color. Add ginger garlic paste. 5. Saute till the raw smell of ginger garlic vanish. Now add the cooked chicken along with the leftover water. Allow it to boil. 6. In the meanwhile, grind the items mentioned under "To Grind" section to fine powder. Add the ground powder to the chicken. 7. Keep stirring the chicken often till all the water dries up and chicken becomes dry. Add chopped coriander leaves and mix well. Reduce the flame to low and allow it to roast for 5 more minutes. Once the chicken becomes dry and dark brown color, switch off the flame. 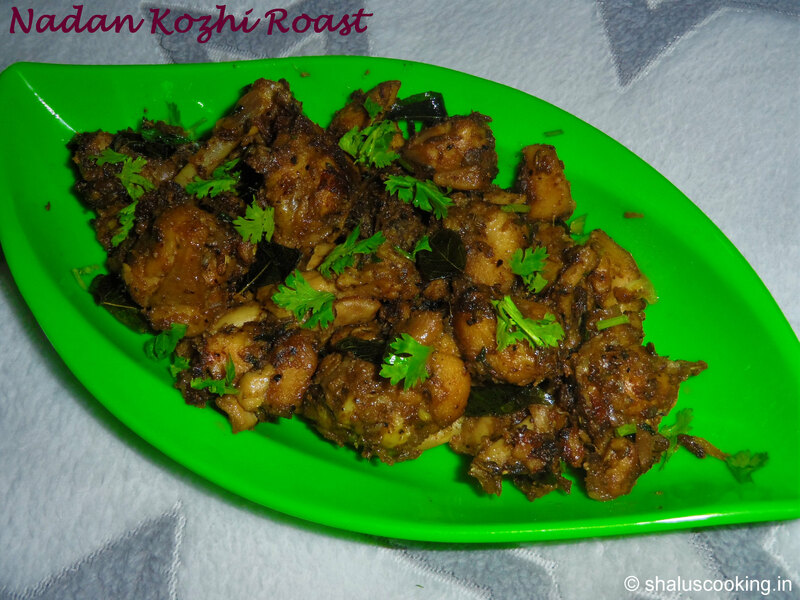 Nadan Kozhi Roast - Country Chicken Roast is ready to serve. Serve it hot with Rasam Rice or Sambar Rice. This goes well with any kind of rice dish. Helps in preventing problems of bone loss like arthritis or osteoporosis.